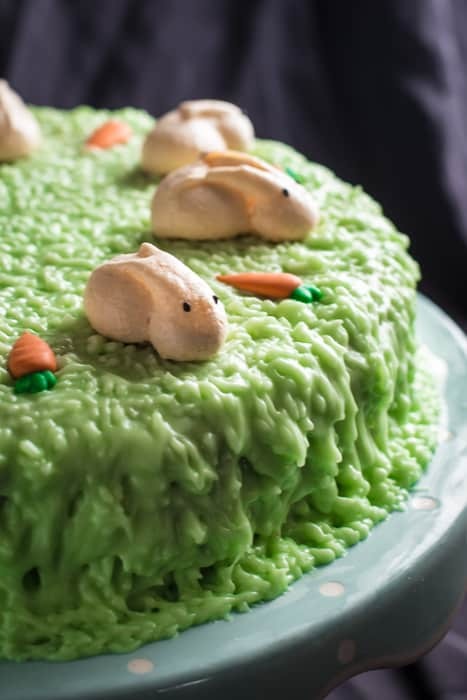 Hey guys, welcome to my Easter Bunny Carrot Cake recipe! My version is dairy free but there are options for you dairy happy folk below too! Let’s hear it for Spring. And cuteness. And sunshine & flip flops! What a relief it has been of late to feel the sun on my skin after what felt like a never ending winter. The only criteria was that it had to utilise the #PowerOfFrozen and be packed full of either Iceland’s frozen fruit, or frozen veg. And I’m pretty sure thy were after the craziest, wackiest ideas we could come up with. As I stared out my office window, working out how on earth I could fulfil this brief, inspiration (finally) struck. In the field outside my window, a mass of bunnies were frolicking in the late afternoon sun. Admittedly it took a while to get from that initial burst of inspiration, to working out how to pipe bunnies out of meringue. But that’s what a challenge is all about huh?! So first up, the cake. 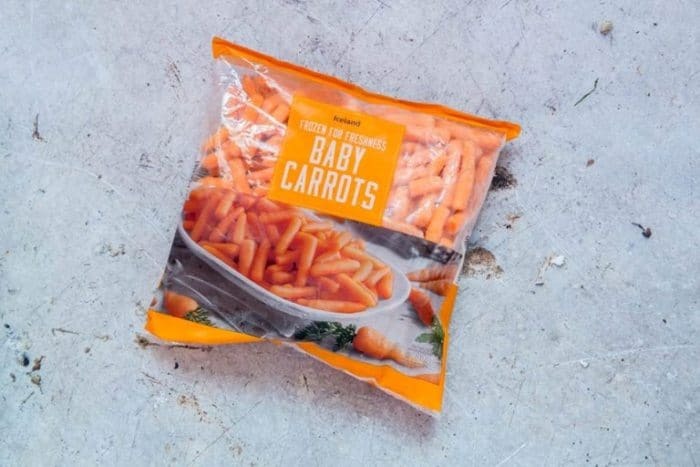 It’s moist and moreish and packed full of carrots. Oh, and I’ve since discovered that these frozen baby carrots are also sublime when roasted too. Let them defrost, then pat dry with a paper towel before roasting in a little hot oil. A big win for zero work! Now the days are warming up I tend to take my cool bag (with pre-frozen ice blocks in) when I go to town. I leave it in the van, then empty my Iceland haul in to it before heading home. Dead easy and keeps everything in perfect shape from store to my freezer. 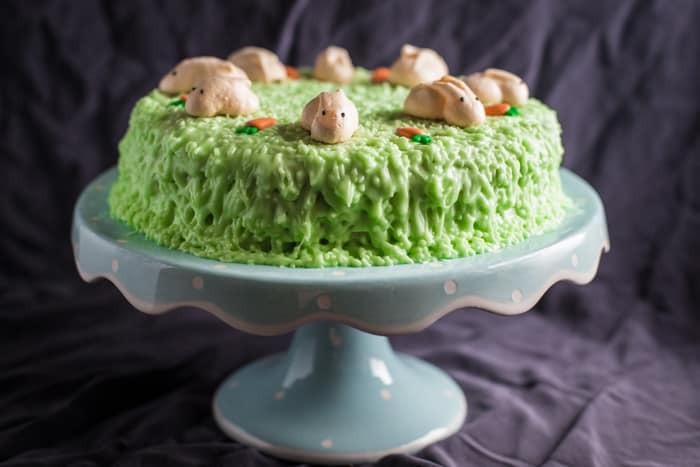 Secondly, this Easter cake is topped with these ADORABLE meringue bunnies. They are so cute and so much fun to make that I hope you get the entire family on meringue making duty this weekend! Now the grass didn’t turn out quite as I would have liked. I used dairy free cream cheese instead of regular, and had to add a tonne more icing sugar than I was expecting as it just stayed so wet. If you need more crazy food ideas for the Easter holidays, then keep an eye out on Twitter for the #PowerOfFrozen hashtag. I have a feeling things are going to get slightly surreal over there! Happy Easter friends, we’re off camping now so see you soon! 150g icing sugar *if you're using vegan cream cheese you'll end up using a lot more icing sugar! Heat the oven to 110/225/gas 1/4. Line a baking tray with silicone or non stick parchment paper (don't use foil or greaseproof paper as these meringues are delicate & may stick). Using an electric whisk, beat the egg white until stiff peaks are formed. Add in the sugar, one spoon at a time, letting it get mixed through for 2 or 3 seconds between each spoonful. When the mixture is stiff and glossy, scoop into a piping bag with a large spoon. Pipe one ball of meringue, about an inch in diameter. Add a second, smaller ball on the side for the head, then stop squeezing the bag and drag the nozzle back to form one ear. Without squeezing, touch the tip at the front of the head where the second ear would start, and drag back to create the second ear. Bake the bunnies for 1-1.5 hours, or until the bunnies com away easily from the sheet. Pop on a wire rack to cool fully before storing in an air tight tin. These can be made weeks ahead of time and will last well. Preheat the oven to 180/350/gas 4. Lightly grease a 20cm cake tin and add a disk of baking paper to the base of the tin. Sift together the flour, baking powder, mixed spice and salt into a bowl. In a second bowl beat the butter and orange zest together. Add in the sugar and continue until the mixture is light and fluffy. Drop in one egg at a time, along with one tablespoon of the dry mix, and mix well before adding the next. Fold through the rest of the dry mix, then fold in the carrots, ground almonds, dates and walnuts. Scoop the batter into the cake tin and smooth out. Bake in the pre-heated oven for 45 minutes, or until the top springs back when pressed with your finger. Run a knife around the sides of the tin and turn out onto a wire rack to fully cool. I let mine then sit in the fridge for an hour to make the icing easier. When your cake is cold, mix up your frosting to use straight away. Add the green food colouring until you have the colour 'grass' you like and scrape the frosting into a piping bag fitted with a 'grass' nozzle. Pipe the grass all over the top of the cake, or double the recipe if you'd like to cover the sides too. 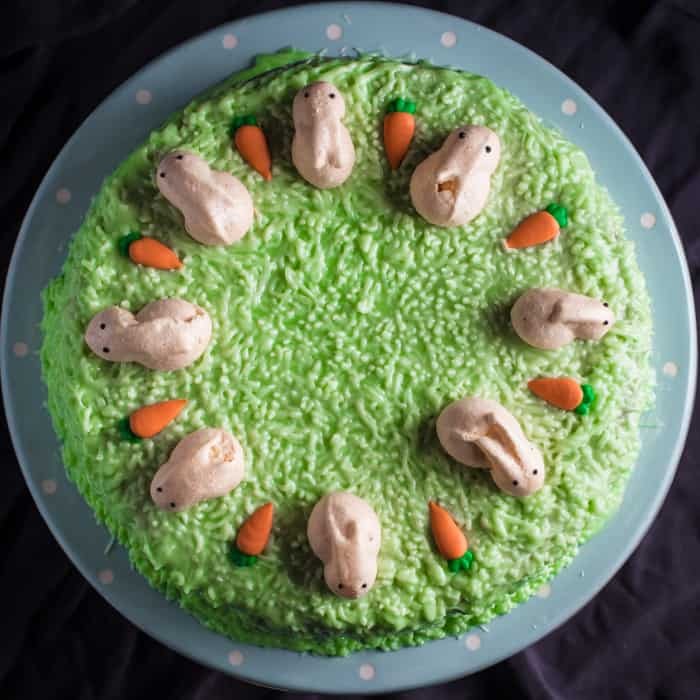 Finally, top the cake with your delicate meringue bunnies, marzipan or sugarcraft carrots and enjoy! HUGE thanks to Iceland for this truly bonkers brief, and allowing m to continue bringing you tasty recipes, for free. As always all thoughts (and leftovers!) are my own. I really love that this is diary free Jane. Happy Easter to you. How clever are those bunnies! And good heavens I know that they’d taste ten million times better than peeps. I’m not a peeps fan, but I know I’d love this cake. 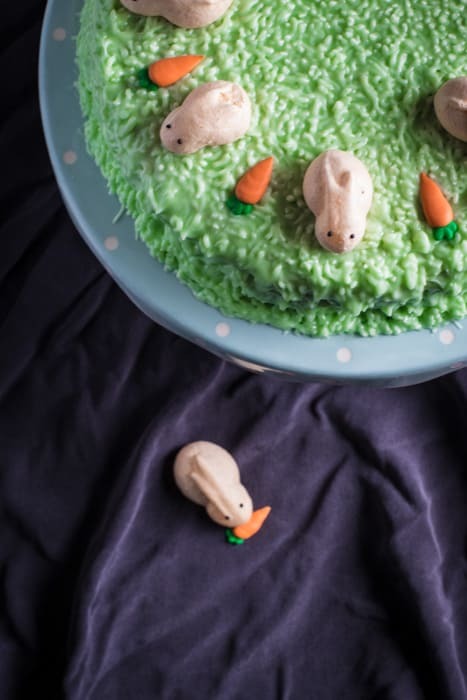 This cake and the bunnies are so cute! Looks delish! 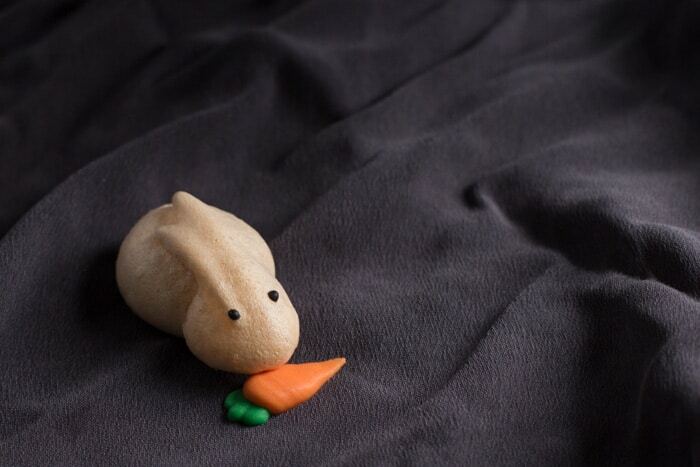 Those meringue bunnies are adorable – and simply brilliant! 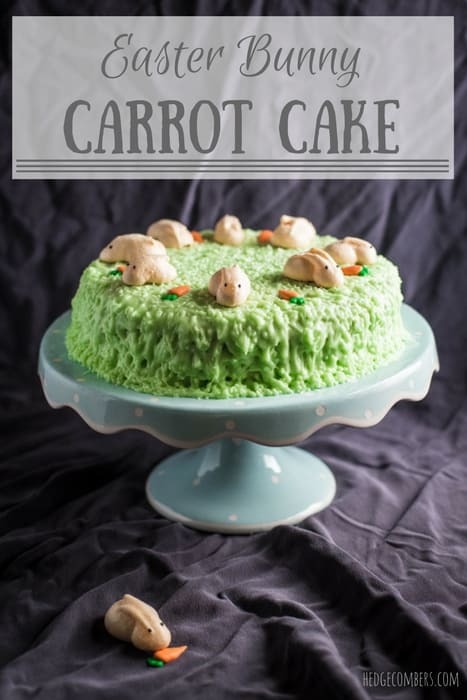 What a pretty cake – and love the amount of carrots in it! This is such a cute looking cake!! Love it. Those meringue bunnies are absolutely adorable! What a great idea!